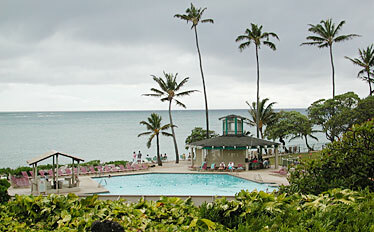 The Turtle Bay Resort's pool lies adjacent to a natural bay. The owners of the Turtle Bay Resort were blindsided yesterday by Gov. Linda Lingle's pledge that the state would attempt to acquire the 859-acre property on Oahu's North Shore. "We were surprised to learn about the governor's proposal," said Nicola Jones, chief executive officer of Kuilima Resort Co., the local entity that has owned the resort since 1988. "This was the first time that we heard about her proposal and would have welcomed the opportunity to discuss our situation with her." The company is open to discussions with the governor, but Jones said it still plans to move forward with the proposed development of the resort, which includes up to 3,500 hotel and condominium units. Meanwhile, Turtle Bay also is working to resolve a $283 million foreclosure lawsuit filed last month by its international lender Credit Suisse, representatives of which couldn't be reached for comment yesterday. The financially troubled resort has been on the market for more than a year, but potential buyers and development partners have been unwilling to touch the controversial site on one of Oahu's last remaining rural coasts. Of the resort's 859 acres, 254 acres have been designated for development, which includes the existing hotel, said Kuilima spokesman Nathan Hokama. Most of the remaining land would be kept as open space and for recreation areas, he said. Representatives of Los Angeles private equity firm Oaktree Capital Management LP, which owns Kuilima, didn't return a call for comment. The resort's broker, Steven McKenzie of New York-based Eastdil Secured LLC, also declined comment. Lingle expects the cost of Turtle Bay will be less than $500 million -- less than half of the resort's estimated $1 billion value if fully developed -- and said that financing the acquisition could come from a variety of revenue sources. "We were all caught off guard," said Lea Hong, the Hawaiian Islands program director for the Trust for Public Land, which would be involved in raising money for the acquisition. "It's a tremendous undertaking, it's very ambitious, but at the same time it's very hopeful too. There may be ways of financing this, hopefully without burdening taxpayers and the city and county unduly." Keith Vieira, senior vice president of operations for Starwood Hotels & Resorts, which last year backed away from a deal to purchase part of the resort, said: "This is not about simply preserving land. It's about jobs, the viability as a destination, people out there who don't want to drive every day into town." Vieira said a stand-alone hotel could survive, though it would have a difficult time thriving because it would be more expensive and harder for guests to get the same amenities found in resort areas.